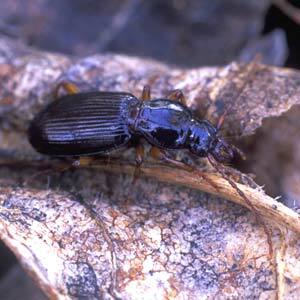 Description: A medium (7-8.5mm) dark red-brown ground beetle with conspicuous mouth-parts found on rich soils in meadows, fields and gardens. Widespread but usually found singly. World Distribution: A European Wide-temperate species (63) distributed across west-central and southern Europe to the Caucasus and Asia Minor. Introduced in North America (Bousquet, 1987). Irish Status: Widespread but scarce and nearly always encountered singly. Ecology: Mostly recorded from rich humus soils on well vegetated lakeshores or in damp deciduous woodland.